. . . love it. Okay, not the heat: that's miserable, even indoors with the AC cranked down. But the freedom? Oh, yeah. Good stuff. It was lovely to have the 12-month administrative contract's salary, but having summers pretty much all to myself honestly is worth the pay cut. And an arrival, a mad splurgey indulgence on Y!J. 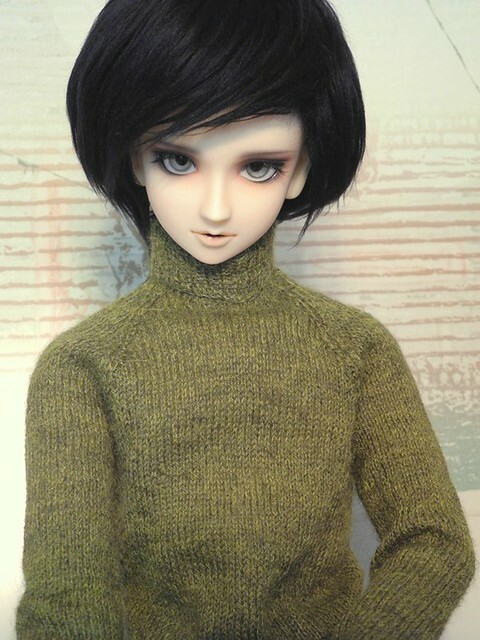 This is Norimasa, Nori for short, a one-off Tsukasa with a faceup by the Korean artist Gate 51. .... *eyetwitch*... ok he might be my most favorite boy of yours now. oh my gosh. his faceup, i LOVE love love his pale lips!! omg, he is GORGEOUS. the sweaters rock. i LOVE the pink one, and the buttons! the buttons!!! i love the hand knit sweaters ♥ i could become addicted to them. Oh, let me know if you have that article from Haute Doll with the Pharoh and his family in it. If you don't I can scan the photos for you. Oh my, a Tsukasa one-off!! *___* your new boy is wonderful and so handsome, congrats! !